Let’s talk about our love of tacos! The options are endless when it comes to choosing the kind of shell, the meat and your favorite toppings. While most enjoy a standard ground beef taco with lettuce and cheese, we decided there are just too many options to stick to one recipe every time. Branch outside of ground beef and soft shells this week by spicing up your taco night with one of our tasty Aprons recipes! Make life easier by grabbing a rotisserie chicken while you’re in the store. Shred this chicken and add some hot sauce and jalapenos for a spicy addition. 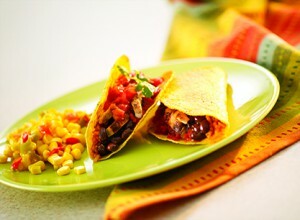 You can also try some of our favorite Aprons chicken taco recipes. Pork is a delicious addition and can be made using your slow cooker. As a timesaver, you can stop by our Deli and give our Smoked Pulled Pork a try. Add some barbeque sauce and make your favorite slaw recipe for BBQ pork tacos. 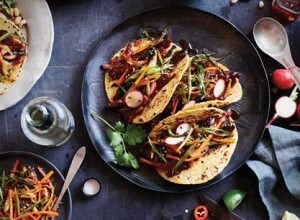 Step up your pork tacos with some delicious Aprons pork taco recipes. For a lighter option, give fish tacos a try. Whether you want to use cod, shrimp or tilapia, we have a lot of easy options for you to try if you don’t want to spend a lot of time cooking. Our Ready-to-Cook and frozen entrees are perfect if you’re making dinner in a hurry. After cooking and sliding your fish onto a tortilla, squeeze on some lime, add in cabbage slaw and top it with some avocado. 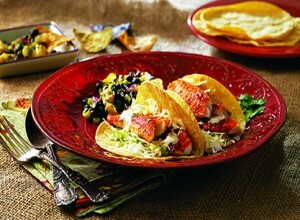 Here are some of our favorite Aprons fish taco recipes. Need more inspiration for Taco Tuesday? Our Aprons team has put together lots of amazing recipes for you. Which taco recipe are you going to make first? Let us know on Facebook, Twitter and Instagram.